The USB 3.0 standalone duplicator and eraser dock let you connect your SATA HDDs or SSDs through SuperSpeed USB 3.0, with the ability to swap drives in and out as needed. The dock also functions as a standalone drive duplicator and eraser - an efficient and versatile solution for external drive management. Featuring standalone Sector by Sector hard drive duplication with built-in LED progress bar, and support for 2 drive single pass over writing the hard drive duplicator is a user-friendly all-in-one solution for any application requiring hard drive duplication or erasing. 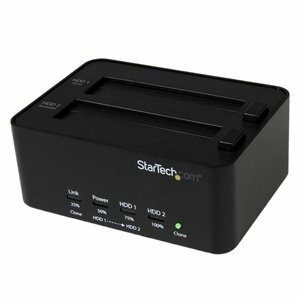 With support for SATA I/II/III, and large capacity drives this HDD/SSD docking station is compatible with virtually any SATA hard drive, and greatly increases the storage/backup capabilities of your computer. The SATDOCK2REU3 USB3.0 Standalone Duplicator and Eraser Dock lets you connect your 2.5in/3.5in SATA HDDs or SSDs through SuperSpeed USB 3.0, with the ability to swap drives in and out as needed. The dock also functions as a standalone drive duplicator and eraser – an efficient and versatile solution for external drive management. Featuring standalone Sector by Sector hard drive duplication with built-in LED progress bar, and support for two drive single pass over writing, the SATDOCK22EU3 is a user-friendly all-in-one solution for any application requiring hard drive duplication or erasing. With support for SATA I/II/III, and large capacity drives (tested up to 4TB), this HDD/SSD docking station is compatible with virtually any SATA hard drive, and greatly increases the storage/backup capabilities of your computer. Extend the value of this hard drive docking station further with the addition of our SATA to IDE Hard Drive Adapter (SAT2IDEADP), allowing easy insertion of any 2.5 or 3.5in IDE hard drive into a SATA hard drive dock.